Hod Lipson is a professor of Engineering and Data Science at Columbia University in New York, and a co-author of the award winning book “Fabricated: The New World of 3D printing”, and “Driverless: Intelligent cars and the road ahead”, by MIT Press (translated into 7 languages). Before joining Columbia University in 2015, Hod spent 14 years as a professor at Cornell University. He received his PhD in 1999 from the Technion – Israel Institute of Technology, followed by a postdoc at Brandeis University and MIT. 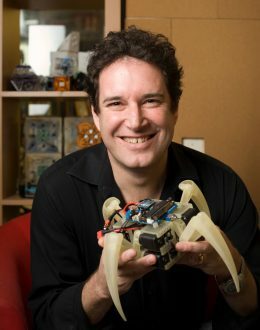 Hod Lipson’s work on self-aware and self-replicating robots challenges conventional views of robotics, and has enjoyed widespread media coverage. He has also pioneered open-source 3D printing, as well as electronics 3D printing, bio-printing and food printing. Lipson has co-authored over 300 publications that received over 14,000 citations to date. He has co-founded four companies, and is frequent keynoter both in industry and academic events. His TED Talk on self-aware machines is one of the most viewed presentations on AI and robotics. Hod directs the Creative Machines Lab, which pioneers new ways to make machines that create, and machines that are creative.